You will experience Ten economic peaks and ten recessions in your lifetime. What is behind the name Ten Peaks Partners? In the U.S. the average lifespan is approximately eighty years. Throughout history, the average economic cycle has lasted between five and eight years. Most investors will see at least ten market cycles in their lifetimes. Our mission is to preserve and grow client capital across all market cycles. Taking a long term perspective is essential to achieving results. Source: Bloomberg and FRED. S&P 500 quarterly price data from 1927 to 2018. Return adjusted with CPI. Market price data excludes dividend reinvestment. Partnership and teamwork are fundamental to achievement. Investing and life are full of emotions. Peak experiences can be followed by devastating uncertainty, new beginnings, and new peak experiences. We are committed to being an industry leader and partner of choice. The S&P 500 Index is an unmanaged index of 500 stocks used to measure large-cap U.S.stock market performance. Investors cannot invest directly in an index. Index returns do not reflect any fees, expenses, or sales charges. This chart is for illustrative purposes only and not indicative of any actual investment. 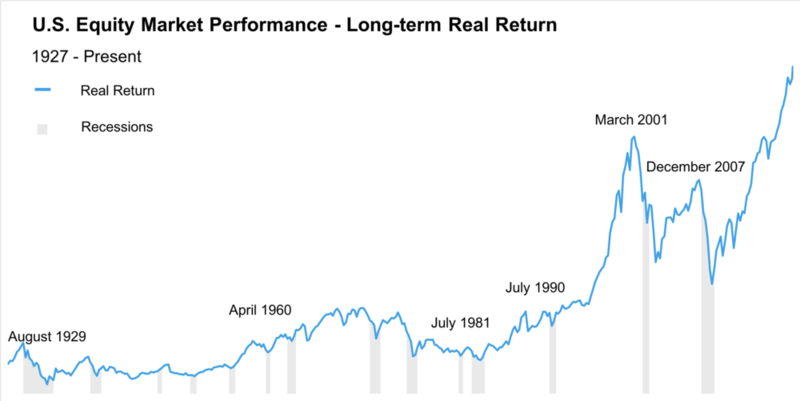 These returns were the result of certain market factors and events which may not be repeated in the future. Past performance is no guarantee of future results. The information presented is not intended to constitute an investment recommendation for, or advice to, any specific person. By providing this information, Ten Peaks Partners is not undertaking to give advice in any fiduciary capacity within the meaning of ERISA and the Internal Revenue Code. Ten Peaks Partners has no knowledge of and has not been provided any information regarding any investor.